Tues. #1 is HERE. To help the website out please subscribe to Mistah MegaManFan so we can reach 1,000 (current count: 848). If you're a gamer you'll enjoy the content! Don't miss Nickolye's 205 Live Recap at 10 ET! With the cheap plugs out of the way here's Tuesday's latest news. In a rather insulting post on Facebook, Superstar Billy Graham told Kofi Kingston to get on steroids: "I urge you to start doing some steroids and add about 50 pounds of solid muscle to your championship body. Vince wont care, honestly. Actually he would be quite pleased with the muscular transformation, as I predict that you young man will have the longest run as WWE champ in modern-day history. Then in just a short time while you are red hot and the fans are celebrating your win, your 2 former partners in crime, E and Woods get jealous and turn on you. In my day there would be some blood in that double cross on you but God forbid... not now. You then have Daniel Bryan for rematches and your two former partners as opponents. The final suggestion, is to get all of my promo material together that you can find in the WWE's vast library and study my promos. You must be an entertainer as well as a wrestler my man." 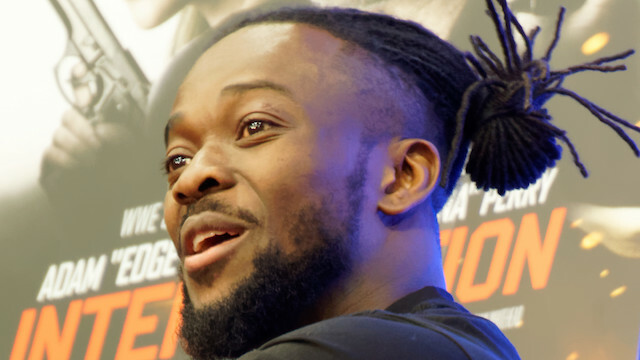 Incidentally according to WrestlingInc.com, Kofi is scheduled to continue feuding with Daniel Bryan until at least June, and http://www.bostonglobe.com/sports/2019/04/08/kingston/VcIfNvQoUNAQZP6zVmgYXK/story.html here's a new Kofi Kingston interview. After Conor McGregor took to Twitter to congratulate Becky Lynch on becoming the first "champ champ" Sunday night, someone pointed out to him that Chris Jericho had done it long before Rebecca did. He tried to disagree so Jericho schooled Conor in response: "Thanks for the explanation of the rules Champ Champ. But Both belts were won under the same organization, on the same night. Now quit being a mark and move along, junior." Via Instagram The Miz revealed he got staples in his head after fighting Shane McMahon on Sunday: "Sometimes winning isn't defined by a 1,2,3. Last night at #Wrestlemania I whooped Shane all over @mlstadium Today I hurt, I've got staples in my head, my body aches but my heart is full knowing I made my dad proud. And there's no win bigger than that." Even as WWE is already promoting WrestleMania 36 in Tampa next year, the Los Angeles Times says L.A. is a front runner for WrestleMania 37 in 2021. * Toa Henare, YOSHI-HASHI and Kota Ibushi v. TAKA Michinoku, Taichi and Zack Sabre Jr.
Japanese star Hikaru Shida has officially signed with All Elite Wrestling. I'm not sure what's going on right now, but she wasn't on Raw last night, and Sasha Banks withdrew from her appearance on Wendy Williams today. Methinks she might be injured. The Young Bucks have announed they'll defend the AAA Tag Team Titles against the Lucha Bros. at Double or Nothing. Speaking of the Bucks here's a new AEW video. Via social media Will Ospreay has confirmed he's staying with New Japan. Here Billie Kay talks about the IIconics' goals: "Ever since we came into each other's lives, we had this one goal, and we wanted to do it by each other's side. And every step of the way we have been by each other's side. We are so in love. She is my life partner, my high school sweetheart, and the fact that we walked out onto our first WrestleMania and won the women's tag team titles, I am beyond happy." Oney Lorcan has announced http://twitter.com/_StarDESTROYER/status/1115640087520468993 he will be on 205 Live tonight. 3:00 PM ET. Here's WWE's schedule for Worlds Collide. Two over-the-top-rope Battle Royals - one for male Superstars and one for female Superstars - will take place on Brands Collide. Both Battle Royals will feature Superstars from NXT and NXT UK, and the Men’s Battle Royal will additionally feature Superstars from 205 Live. Who will be the last Superstars standing when the dust settles? In this IG photo with Bret Hart, Ronda Rousey's right hand is clearly in a cast. According to http://pagesix.com/ Wendy Williams and staff are "FUMING" over Sasha Banks cancelling today's appearance, and she won't be invited back. 4:00 PM ET. Allegedly http://twitter.com/SliceWrestling/status/1115670495221964801 something that happened backstage at WrestleMania 35 is the reason Sasha Banks is so upset. Also allegedly http://fightfulselect.com/ referee Rod Zapata was fined by Vince McMahon for messing up the finish of the WrestleMania 35 main event. For those interested http://www.wrestlinginc.com/news/2019/04/sam-adonis-recalls-being-tailed-by-a-black-escalade-in-652955/ here's a new Sam Adonis interview. According to ShowBuzzDaily.com this week's Raw did 2,923,000 viewers and a 1.08 rating in the 18-49 demo, the highest numbers for the show this year. They also report that Sunday's USA Network airing of the WrestleMania pre-show drew a 0.27 rating in 18-49 with 749,000 viewers, the same demo as last year but down 1% in total audience. In addition this year's WWE Hall of Fame special on USA Network did 0.34 rating and 1.154 million viewers, up from the 0.25 and 665,000 last year. 5:00 PM ET. CM Punk thinks https://twitter.com/SauceAndShram/status/1115331236908666881 Shane McMahon calling himself "Best in the World" is WWE taking a shot at him. 6:00 PM ET. If the alleged date of June 7th for the next Saudi show is true, WWE would have a very tough turn around getting to Stockton for a house show on June 9th.